We have a great weekend planned. Tomorrow, Greg is going to be the photographer for a friends party, “Inappropriate Haf’la“. And, we’re SO looking forward to this party. 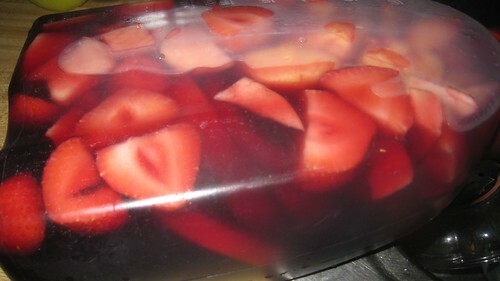 The party is a BYOD/F (bring your own drink and food) and I told Greg that I wanted to make a Sangria of some sort. So, tonight we went to the grocery and liquor store and bought all of our ingredients as well as food and snacks for the party. Let me tell you, I am so freaking excited about this drink! 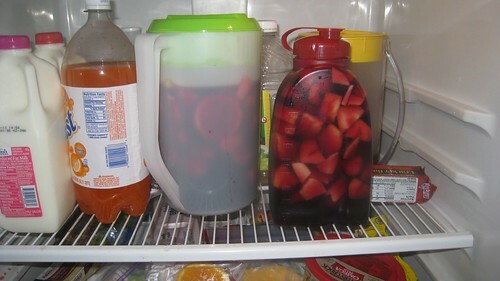 That jug on the right, the one LOADED with fruit… that’s all mine, baby, and I can not wait. 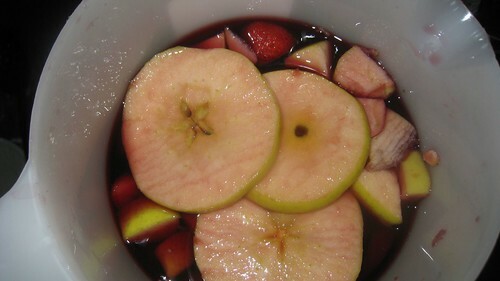 I’ve been informed, because I am pretty much a virgin when it comes to alcohol and drinks, that the fruit, especially apples, soak up the alcohol (wine and brandy in this case) and are pretty much ediable (alcoholic) shots of fruit. With that knowledge, I loaded up on the fruit. The party is a ‘sleep-over/camping-in-the-backyard’ event. Greg and I are not going to be sleeping over… because we don’t have anything to sleep outdoors with. But, we’re going to stay as late as we can (but not too late). Oh, and if you’re wondering where Amelia is, she’s with MiMaw. I told Mom of our plans and she was like “Oh! Well, you don’t want to take Amelia along, you want to enjoy yourself! So, why don’t I watch MiMi for the weekend?” Greg and I had all intentions of bring Amelia with us, but… couldn’t resist Mom’s offer – AND, it allows me to really enjoy myself (which is probably another reason why I am so frickin’ excited about the Sangria). On Sunday we’re going to the Maryland Renaissance Festival! It has been years since I’ve attened the RennFest and I’m pretty excited about this too. So.. yeah… totally looking forward to this weekend. Oh, and sleeping in tomorrow (err… later today) morning! We made Spodie last year when we were camping, OMG it was delish!!! We used cantaloupe, honeydew, peaches, nectarines, strawberries, watermelon and some other stuff, and there was a ton of difference alcohol in it, and DAMN it was good!